The first graphic novel presenting the story of Granuaile, the Pirate Queen of the West of Ireland, deserves attention. Sixteenth century Ireland was a turbulent time, with clans living and competing under Brehon Law, invasion from the East by the British, and plunder along the west coast by the Spanish. Granuaile (known in English as Grace O’Malley), the daughter of a Connacht seafaring chieftain, grew up wanting to sail with her father aboard his mighty ships. He forbade her to board, citing (according to legend) her long fiery hair which would get caught in the ropes. She defied her father by cutting off her hair and dressing like a boy to stow away on one of his voyages. 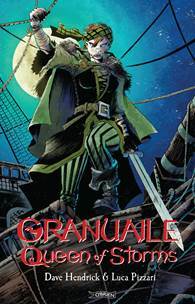 Granuaile honed her seamanship and fighting skills, and eventually took her father’s place at the head of his fleet, leading men and ships into battle against neighbouring clans and plundering Spanish Armada ships plying the coast. She fought for her country, to protect its customs, culture and traditions against the encroaching rule of those who sought to destroy it. Along the way, she married and bore children while never relinquishing her leadership and establishing strongholds in several locations along the west coast, especially in counties Galway and Mayo. As the rule of the British Empire under Elizabeth Tudor spread west, Granuaile’s strength was deemed to be a threat. To keep her in check, the British attacked and took her family as hostages. Granuaile, who ruled the seas and risked her life to protect her family and her way of life, sailed up the Thames and negotiated with Queen Elizabeth for the return of her family. * In exchange, Granuaile promised to maintain peace with the British while allying with them against the Spanish. Follow the tale of Ireland's Queen of Storms brought to life in this astounding and sometimes tragic yet historically accurate and stunningly illustrated full-colour graphic novel. It takes us on an exciting and sometimes gruesome adventure alongside the brave and fierce woman whose passions, motivations, tragedies and triumphs are brought to life. A warrior and leader of men, defiant Granuaile became the most revered woman in Ireland for generations to come. Teens and young adults are likely to find this both entertaining and informative. A great distraction for those rainy days anchored with nowhere to go! Dublin native Dave Hendrick's previous work includes The Symptoms (Zuda) and Short Sharp Schlocks. He is currently working on a number of projects including a Pearl Jam comic book anthology and other graphic novels. Luca Pizzari is a freelance cartoonist currently living and working in London.